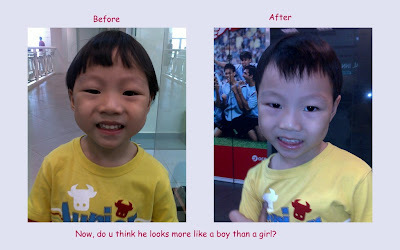 Finally, on 6th Mar 2010, Baby G got his first professional haircut (excluding the 1st month shave). Baby G has never wanted to go to the barber nor the hair salon to cut his hair cause of the noise made by the shaver. Today, I don't know why, but I actually asked Baby G if he wanted to cut his hair at 'Mr Barber'. I expected the usual 'no' but got a pleasant surprise when he actually said 'yes, ok'. So after his Phonics class, we popped over to the hair salon. He happily walked into the salon and sat on the chair, eating his raisins while waiting. During the wait, I kept preparing him and said that we'll only ask the lady to use the scissors to cut and will not use the shaver. Soon it was our turn, he was fine until he sat on the chair and the lady tried to put the sheet around him. Then he started to panic and I could see the regret on his face. He wanted to leave the chair. We struggled a little before we removed the sheet from his neck and placed it up til his chest. I asssured him that I'll be with him the whole time and held his hands tightly. Lucky the lady was pretty fast, with about less than 15 snips, it was over. But we were all covered with his hair and it started to itch and made him unhappy. Although he didn't cry, he looked mighty unhappy. He sulked all the way home. I think we'll not be visiting the hair salon anytime soon and looks like I may have to continue to be his personal hairdresser. Looks handsome after the haircut. He still managed to 'smile' in that photo.